On the heels of a solid performance in the ratings last night, CBS has renewed its successful Summer drama, Flashpoint, for a second season. 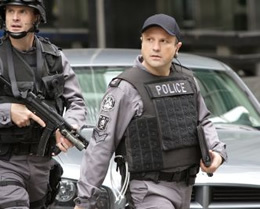 Flashpoint was originally developed by Canadian network CTV. CBS decided to license the series during the infamous writers strike earlier this year. CBS started airing the drama on Friday nights beginning on July 11th. The network was encouraged by the early numbers and moved it to Thursday nights, switching places with ailing Swingtown. The numbers dipped a bit but were still respectable, especially for a Summer series. After a two week hiatus, Flashpoint returned to the schedule last Thursday and attracted 8.5 million viewers — outperforming the series’ premiere. Last night, the drama held onto 95% of CSI’s audience with 9.7 million, another series high. When a new show fails. Last month, CTV announced that they were renewing the series for another season and production is expected to resume in early 2009. Between the show’s recent ratings and lower cost, it comes as no surprise that CBS has also renewed Flashpoint for 13 more episodes. When Flashpoint will actually return to CBS is unclear. There are still four first season episodes left to air and they aren’t currently on the schedule. If one of the network’s new Fall shows tanks, Flashpoint could certainly fill in. If CBS decides to kick off season two in midseason, they could hold the leftover episodes until then. One thing is for sure, with such solid numbers, it’s unlikely that CBS will make fans wait until next Summer to see the cops of the Strategic Response Unit return. Stay tuned! Bring Flashpoint back miss it. Best show ever!!!! Hoping it returns very soon. Thank you for bringing back this wonderful show with its great stores and cast. I was hoping that it would return soon. Keep it going… a fan of Flashpoint. please, please keep Flashpoint going, we find it to be one of the BEST drama shows on tv and superior cast and writers. Would gladly give up csi miami which is quite lame for this realistic and extremely well acted show. Have posed the question all around our family an friends which is a considerable number of people and ALL LOVE FLASHPOINT AND HATE WHEN IT IS NOT AVAILABLE. Just thought you may want to have this imput. This show very much matters to all of us. Please bring back Flashpoint it is very clean for familys to watch and that is hard to find. I really like the show and cast members. Please update your website. CBS is very good about cancelling shows.. BUT.. Flashpoint should NOT be one of them. Good show and very good cast that work well together (with good writers). I just saw David on Supernatural.. so that is a slight hint that they are going bye..bye. I certainly hope not… CBS try this.. Cancel.. csi miami and put FLASHPOINT there.. If CBS needs any more help with there fall lineup.. they can email me..